◾　Akihiro Ohno, Yohta Yamamoto, Megumi Oguro, Koichi Suzumori. 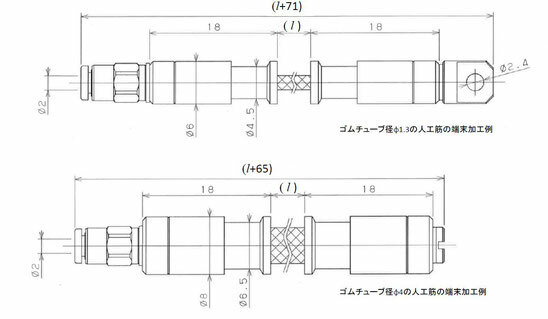 Comparison in Characteristics of Textile Woven by Thin Pneumatic Artificial Muscle, The 6th International Conference on Advanced Mechatronics, Proceedings of the 6th International Conference on Advanced Mechatronics, The Japan Society of Mechanical Engineers, No. 15-210, pp. 43-44, Dec. 2015. ◾　Shunichi Kurumaya, Feng Ni, Koichi Suzumori. Design of Hexapod Giacometti Robot with Very Long， Light， and Thin Legs, The 6th International Conference on Advanced Mechatronics, Proceedings of the 6th International Conference on Advanced Mechatronics, The Japan Society of Mechanical Engineers, No. 15-210, pp. 136-137, Dec. 2015. ◾ 車谷 駿一, 鈴森 康一, 難波江 裕之. 三つ編み構造に基づく細径マッキベン人工筋の織布化, 第16回システムインテグレーション部門講演会, pp. 620-622, Dec. 2015. ◾ 大野晃寛, 山本陽太, 小黒 めぐみ, 難波江裕之, 鈴森康一. 細径空圧人工筋肉を用いた腰部パワーアシストスーツの試作, 第16回計測自動制御学会システムインテグレーション部門講演会, 第16回計測自動制御学会システムインテグレーション部門講演会予稿集, pp. 1550-1552, Dec. 2015. ◾ 鈴森 康一. 細径人工筋を用いたデライトウェアの開発, 第16回計測制御学会システムインテグレーション部門講演会（SI2015）, 公益社団法人 計測自動制御学会, pp. 2527～2529, Dec. 2015. ◾　車谷駿一, 森田隆介, 鈴森 康一, 脇元修一. 細径マッキベン人工筋を用いた筋骨格ロボット機構の研究 第４報 股関節筋骨格ロボット機構の試作, 第33回日本ロボット学会学術講演会, 第33回日本ロボット学会学術講演会講演論文集, RSJ2015AC1A1-03, Sep. 2015. ◾ 森田隆介, 車谷駿一, 鈴森康一, 脇元修一. 細径マッキベン人工筋を用いた筋骨格ロボットの研究 第5報 筋骨格ロボット肩甲上腕関節への適用, 第33回日本ロボット学会学術講演会, 第33回日本ロボット学会学術講演会講演論文集, RSJ2015AC3A3-04, Sep. 2015. ◾ 遠山雄, 脇元修一, 鈴森康一, 神田岳文. 多自由度扁平ソフトアクチュエータの開発, 第33回日本ロボット学会学術講演会, 第33回日本ロボット学会学術講演会講演論文集, RSJ2015AC2K2-03, Sep. 2015. ◾ Ayberk Sadic, Akihiro Ohno, Koichi Suzumori. Development of a Human Trunk Exoskeleton with Pneumatic Artificial Muscles, 2015 JSME Conference on Robotics and Mechatronics, Proceedings of the 2015 JSME Conference on Robotics and Mechatronics, May. 2015. ◾ 土井 俊幸, 脇元 修一, 鈴森 康一, 神田 岳文. 細径McKibben 型人工筋の集積化に関する研究 -第1 報：収縮率と収縮力の静特性の測定-, 日本機械学会ロボティクス・メカトロニクス講演会2015, ロボティクス・メカトロニクス講演会2015講演論文集, 1P1-B03, May. 2015. Copyright 2016 s-muscle Co. Ltd. All rights reserved.